2 BR, 2 BA + sofa bed Sleeps 7 - Adjacent Condo E-16 Also Available! Located directly on the slopes of Mount Snow, this owner-managed Seasons condominium can comfortably accommodate 7 people. 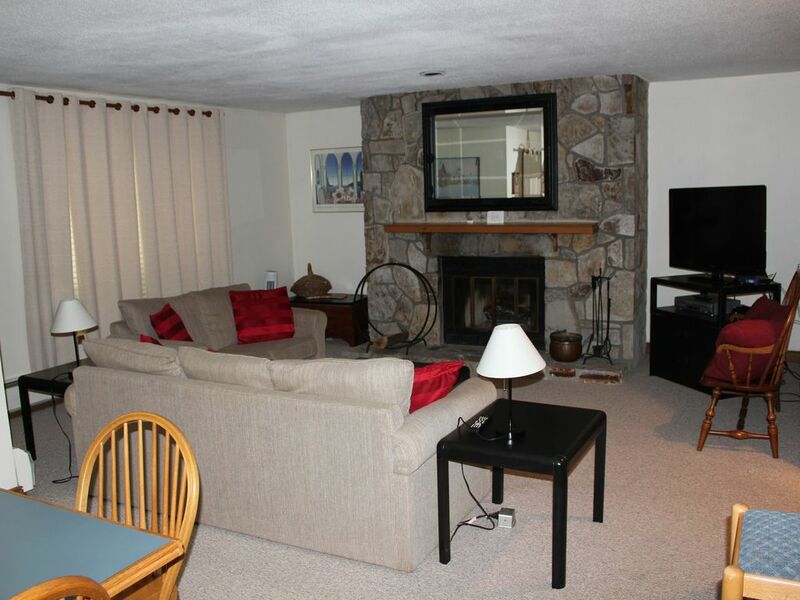 It is an extremely well maintained, clean unit with direct access to Mount Snow trails and lifts. No shuttle required! Outdoor ski locker stores gear for easy access. Sleeping accommodations include one king bed in the master bedroom, and a full size bed and twin bunk beds in the second bedroom. There is also a full size pullout sofa in the living room. Just two buildings away is the sports center with a large indoor pool and two hot tubs. Locker rooms are complete with saunas. The newly renovated game room includes ping pong, a Foosball table, hoops shooter and a huge flat screen TV with surround sound system. Adjacent lounge has a large sofa next to a huge field stone fireplace. Brand new exercise room with all new equipment and wall-mounted LCD. WiFi Internet access available from sports center as well as within the unit. Residing in nearby Bennington, VT, my wife and I purchased the condo adjacent to this one (Seasons E-16, HA 333834 · VRBO 99747) in 2006 as a second home and vacation getaway for ourselves and our new baby girl. Since then, we have added two more just like her (the girl, not the condo) and have, consequently, not done much skiing. During the non-winter months, we spend a good deal of time out in West Dover swimming, hiking, biking and enjoying the majestic views. During the ski season, I brave the infamous VT-Rt.9 several times per week managing, maintaining, and readying the condo for our guests. We purchased the unit adjacent to this one in 2006, and I have embraced the opportunity to have rented and subletted this condo for two winters, but bought it in October, 2018 to give our family and friends more room while we're up there. The previous owner took meticulous care of this condo and made several very alluring upgrades, most notably the kitchen and foyer tiled floor, kitchen cabinetry, and new propane boiler. In addition to giving us the flexibility of having more family and friends joining us on our ventures to Mt. Snow, I can now afford your family a unique opportunity to rent two side-by-side condo units in the beautiful Seasons community, as I believe we are the only owners who offer two adjacent condos for rent in Seasons. Unlike other places in the area, access to the sports center--including unlimited use of pools, spas, saunas, exercise room, game room, etc.--is free for all guests (previously $7.50/person per day). What really sets our place apart from the rest is the attention to detail. When vacationing, our family always prefers to book a place through VRBO or HomeAway over staying at hotels. And while we have, overall, been very pleased with every place we've rented, almost all of them have some degree of the same problem: the lack of an owner's personal touch in the maintenance and preparation of the facilities. We once rented a beautiful 5-bedroom house right near Disney World, and after twenty-something hours of driving from VT to FL with three young children, we arrived at a great house in a wonderful location, but inside there was not a pump of hand soap, a squirt of dish soap, a spritz of cooking spray, a shake of salt or pepper, a square of toilet paper, or a sheet of paper towel to be found. So immediately after unpacking the car, I was right back on the road in search of the nearest grocery store. When you stay at our condo, you are guaranteed not to have these problems. We have a fully stocked kitchen, from the spice rack right down to measuring cups, cheese slicers and a griddle. The paper towel holder will always be full, and there will be dish soap in the dispenser built into the granite countertop, and a full dispenser of hand soap by each sink. There is sugar in the jar above the programmable coffee maker, detergent, fabric softener and dryer sheets in the laundry room and, of course, TP in both bathrooms. Perfect little place for our 2 family ski weekend. We were still able to ski/ride back to the condo in late March which was awesome. Comfortable furniture, enough space in the dining room and everything we needed to cook dinner for the crew. Owner is responsive to any questions or concerns. It's a great rental option. Easy to access and with everything our family needed. A great way to spend new year’s! Excellent experience. I would love to come back again. The unit was well stocked with kitchen equipment, firewood and warmth. The location was convenient secure.